Stay tuned for more information about our work in bringing Zimbabwean marimba to Cleveland, Ohio. 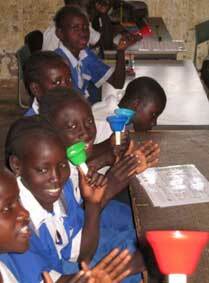 Supporting HopeFirst Foundation translates into supporting projects such as these. Bikes to Africa Project completed in 2010. In 2009, volunteer Sandy Murray visited the sites of the planned Early Childhood Centers in the villages of Munyegen and Saaba. Sandy and CEDAG director Morris Anyim met with the village committees that have received training to manage such projects. $1500 in donations was delivered and received with enthusiasm in Munyegen. Learn more about this project. Milling Machine HopeFirst Foundation and the Puget Sound chapter of Engineers Without Borders (EWB) has teamed up to develop a pedal powered grain grinding machine...another ploy to make the girls work more efficiently so they might end up in school. 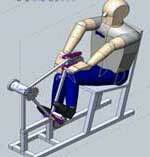 This drawing shows what the pedal mechanism will look like. The hopper and the grinder are placed over the hand position. We purchased a grinding machine with heavy grinding burrs, that the engineers reverse engineered to come up with their prototype. Our hope is that the grinding machine will be 5 times better than what they currently have to work with. It will have to be, as this is as deep a cultural activity as it is a grain grinding activity. 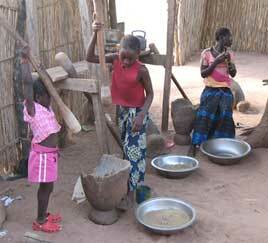 Even very young girls are responsible for getting the grain ready to cook. 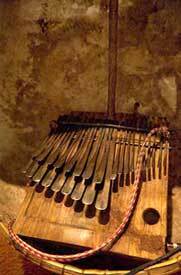 Furthering our mission of cultural exchange, in 2009, HopeFirst Foundation sponsored a U.S. tour for Matemai Mbira Group, one of the top mbira ensembles currently performing in Harare, Zimbabwe. Based in Chitungwiza township, the group takes its name from the totem of leader and featured vocalist Newton Cheza Chozengwa (also known as Newton Gwara or simply Matemai, which means elephant). Virtuosic member Tinirai Jonathan “Simboti” Mazura accompanied Matemai for this trip. 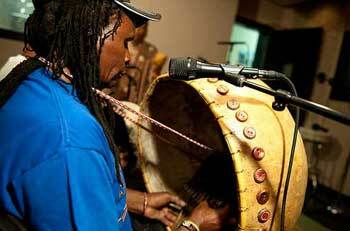 Mazura plays the nhungudzo or lead mbira, while Matemai plays the large, deep-voiced bass mbira (dinhidza), interweaving intricate counter-rhythms and bass lines into the mix. American fans of mbira music know Matemai, former leader of the Nheravauya Brothers Mbira and Marimba ensembles, from his many recordings for MBIRA.org (see http://www.mbira.org) and Mhumhi Records (see http://www.mhumhirecords.org/Newtongwara.htm). The 2009 tour lasted from mid-June through August and was the first visit to the U.S. for Matemai. Available now in the US: Harinamunda, CD recorded in Zimbabwe by Matemai Mbira Group. Matamai Mbira Group images courtesy of photographer Jim Bennett, c 2009. In Jurunku, North Bank Division, HopeFirst volunteers taught science classes at Jurunku Lower Basic School, involving students in science experiments, and music and art projects. Barbara Trenary saw to it that eruptions and explosions were an hourly occurrence. Manuals for 100 simple science experiments, along with supplies were left with the teachers for continued science exploration. Terry Bergstedt and her daughters, Morgan and Stephanie brought color coded xylophones and bells (with laminated music) to encourage the connection between the music and counting, reading and teamwork. They also worked on many art projects including self portraits, leaving the classrooms much brighter, filled with the children’s art. They left musical instruments and art supplies following their visit. Donated solar panels were mounted on the roof of the school and Katy Bradford, a HF volunteer installed wiring and fixtures to light 3 rooms, a 12 volt charging system, and 12 volt plugs for each room to power a laptop! Eberhard Reidel worked with a group of street kids at a community center in Tandeling with small groups of children, mostly 6th graders, giving each child a small digital camera to take pictures of his or her environment. At the end of the day, each child got to choose 2 pictures to print and take home. Sandy distributed some of the 1000 pair of shoes she procured from CROCS, with decreasing hookworm infestation the ultimate goal. In Medina Wallum and Sambang, volunteers continued with more science and art teaching and fun with students and teachers. Terry Bergstedt and Mr. Djemba Jallow, the headmaster and fellow artist, painted a mural on the outside wall of the newly built school in Medina Wallum. 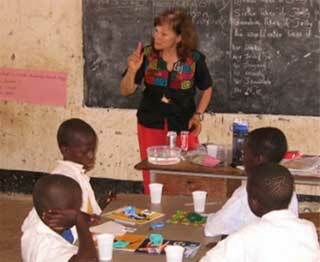 Funds to build the school were procured in 2008 by HF volunteer Barbara Trenary. 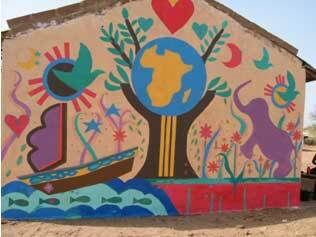 The mural represents many important points in the lives of Gambians. Morgan, Stephanie, and Katy were also part of the artistic team. In Sambang, Eberhard and Stephanie Clark wowed children with more photo fun. Soccer uniforms donated by the West Seattle Soccer Club were delivered to 4 village schools just in time for the annual Sport Week, a competition between the villages. The kids have been preparing for the week throughout the school year. Both girls and boys teams benefited from the uniforms. Fatou Mata Jallow, a recipient of donated educational funds and a skilled soccer player, was along to coach the girls. 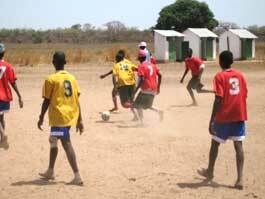 Most villages only have teams for boys. Fatou Mata served as coach and role model for the girls. Sandy Murray visited a small clinic in Nana, to work alongside fellow nurse, Alpha Jallow, for a day. 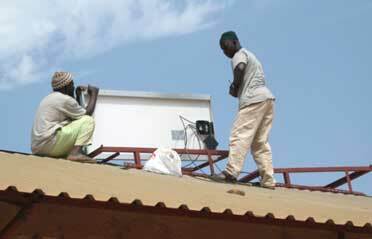 Jallow is the only health care provider for ten surrounding villages. He does everything from deliver babies to treating malaria. 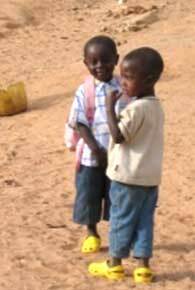 In the rainy season, over 300 children under age 5 will present with fever each month. Without diagnostics, all are treated for malaria. He frequently runs short of medicines, as well as running the risk of overtreatment and parasite resistance. A donated microscope from The Gathering Project of Tacoma, Washington was presented to the clinic. 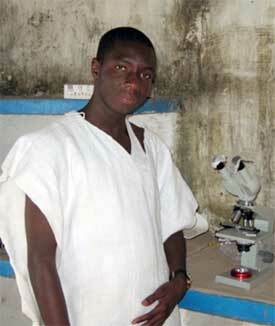 Already trained to interpret the malaria parasite microscopically, nurse Jallow accepted the gift, knowing he will be able to improve the care he gives to his patients. HopeFirst also provided aid for eye surgery to correct for congenital cataracts in a little girl named Mai. Mai has four siblings, but is being raised by her widowed grandmother. As a result of surgery, Mai will be able to attend school. 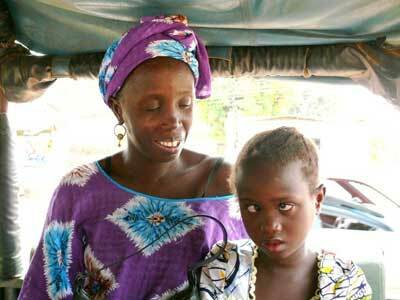 Surgery has improved her vision and appearance, prevented otherwise inevitable blindness, and significantly increases her ability to live a more independent life.